Dr. Krzysztof „Chris” Komarnicki studied classical guitar with Ireneusz Strachocki, Krzysztof Panuciak and Roberto Porroni. He completed postgraduate studies at Grażyna and Kiejstut Bacewicz Academy of Music in Łódź, Poland (pedagogy of music) and attended Master Classes held by Roberto Porroni (guitar), baroque violinist Marinette Troost (early music), pianists Jerzy Marchwiński and Maciej Paderewski (chamber music). His musicianship owes much to Maestro Jan Pruszak, internationally acclaimed Polish conductor. He won „Premio Musica e Natura” in Vicosoprano, Switzerland (twice) and received Honorary Diploma at International Piano Chamber Music Competition in Druskienniki, Lithuania. As a guitarist he focuses on 19th-century chamber music. 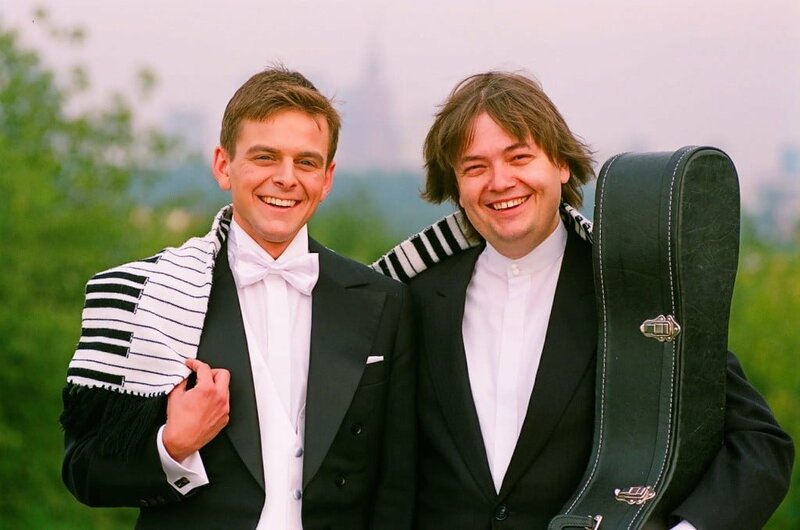 He forms piano-and-guitar duo with Wojciech Łukasz Świętoński, and their ensemble is one of very few in the World performing complete Sonatas for guitar and piano by Anton Diabelli – and the only such ensemble in the World that performs them on modern instruments. He also collaborates with flutist Karina Duczyńska, and their programme of Polish polonaises (originally intended for the ensemble as well as transcribed) was very well received. He transcribes music for various media and his transcriptions were performed by his ensembles as well as such artists as Marcin Dylla, Michał Nagy, Grzegorz Krawiec and others. He transcribed such works as Pictures at the Exhibition by Modest Musorgski and Ballade in F Minor, Polonaise in A Major and Waltz in A Minor by Fryderyk Chopin. Krzysztof Komarnicki is a musicologist of international renown. Already during his studies at University of Warsaw he began to publish extensively on various aspects of musical form and texture in works of John Field, Fryderyk Chopin, Robert Schumann, Joseph Haydn, Jan Nepomucen Bobrowicz, Franz Liszt and Mauro Giuliani. In 1993 he received scholarship and went to Royal Holloway, University of London to study with Geoffrey Chew (music analysis) and late Brian Dennis (composition). His Rhythmic Piece for chamber ensemble was premiered in London during that time. He edited the Selected Works by Jan Nepomucen Bobrowicz in two volumes with extensive historical and biographical introductory notes as well as the in-depth remarks considering performance practice. In his doctoral dissertation Krzysztof Komarnicki put forward his theory of classical sonata forms that – contrary to the previous attempts – works well as a tool for analysis. He teaches music for more than 25 years, including guitar playing, music history and theory of music at all levels from elementary to academic. He lectured theory of form at University of Warsaw and history and theory of music at Copernicus University in Toruń. He gave lectures and master classes at music academies in Poland (Warsaw, Gdańsk, Łódź, Kraków, Katowice) and at various conferences and master classes abroad (including Bratislava, Vicosoprano and Berlin). He works extensively as music critic and free-lance writer, publishing in all leading Polish magazines and periodicals and writing programme notes for Philharmonics in Łódź, Kielce and Wrocław. He appears in radio and television as music critic and commentator of musical life. In recent years he interviewed such internationally acclaimed artists as Garrick Ohlsson, Heintz Holliger, Krzysztof Meyer, David Harrington of Kronos Quartet, Christina Pluhar of Arpeggiata and Ian Gillan of Deep Purple. When he is not thinking about music, he is probably flying his virtual aircraft. He serves as Communication Manager for Virtual Pilots Association.